b) D1's office refusing to obey the Sunshine Law previously regarding a rupester list that she hand delivered twenty-one hours prior to my FL SS 119 request for any lists or names of people who had expressed an interest in being considered for appointment to the PSJ Advisory Board received in the D1 office on Feb. 24, 2005 and I asked for a copy of that list Feb. 25, 2005 but did not receive it until after informing the Brechner Institute and then-State Attorney General, Charlie Crist, of the breach. I was still doing e-mail battle with Scott Knox on March 10, 2005. 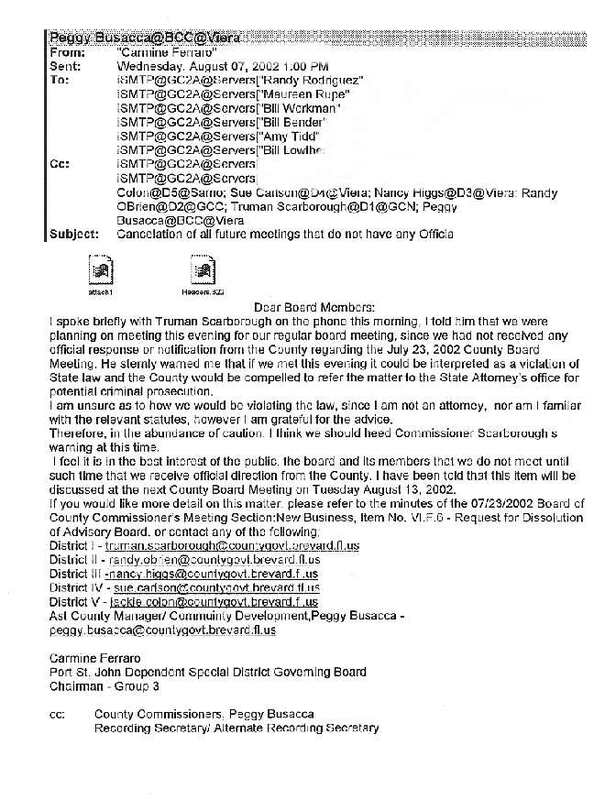 Even a member of that Board at that time, Martin McClellan, was having difficulties getting the same list of names -- even after a FL SS 119 request to D1 -- as of March 11, 2005. The employees of D1 were never punished for such blatant disregard for Citizen Requests and the Sunshine Law and apparently the same atittude is currently being fostered and approved. No surprise. It's Brevard County. Where does it say anything in there that could be considered a LIE? Where is a lie TO, ABOUT, AGAINST, FOR, PRAISING, CONDEMNING, OR ANYTHING OR OTHERWISE AFFECTING MR. RICK MESHBERGER? Why would he consider that a "half-truth" (in his alleged words)? Where is a lie? What made him take offense at that? Where is it that I did ANYTHING AGAINST THE MAN? Yet, he chose to take offense at the fact that he was mentioned as in he just happened to be the person I was dealing with at the IT Dept. If it had been Pinocchio, his name would have been at the top of the e-mail. As you can see, the reason I posted the e-mail is because I thought it was funny. It was NOT to be an afront against Mr. Rick Meshberger. HE CHOSE TO TAKE OFFENSE. He CHOSE to take offense to such an extent that he called me a liar in front of three of his employees. READ the rest of the blurbs of September. Is he mentioned anywhere? Why -- if he was oh, so innocent -- would Mr. Rick Meshberger choose to mention my website at all if he had not CHOSEN to be offended by it? Why would he even mention that I did not put his e-mails on there and that makes the Sep. 16 blurb a lie? WHERE IS THE LIE? The fact that I had to go to the IT Dept. to receive the e-mail nineteen days AFTER my initial request proves that I was having difficulties getting the e-mail. No one was willing to forward ONE STINKING LITTLE E-MAIL THAT -- IF THE INITIAL REQUEST HAD BEEN HONORED AS LEGALLY IT SHOULD HAVE BEEN -- WOULD HAVE NEGATED ALL THIS FUSS IN THE FIRST PLACE. D1 screwed up on this one. They screwed up badly trying to protect themselves. All I did was mention the fact that I had not received the e-mail yet. Based on the evidence "Evidence"? He uses the term loosely, I'm sure. gathered during the investigation He uses that term loosely, also, I'm sure., there is no corroboration that Rick Meshberger directly called Ms. McKinney a liar. Yes there is. There is my word. I am willing to take a polygraph test. Is Mr. Rick Meshberger. Are the other employees? I WILL. The use of that specific word would be inflammatory and could be considered disrespectful. It was and he was. Stating that Ms. McKinney put “half truths” on her website was Rick’s honest opinion So he's allowed an "opinion" and I'm not? I am the employer/customer here. Why is my employee's word given more credence than mine?, and avoided using overly inflammatory language. He called me a liar. I expected nothing to be done about it, but I had to tell the truth and report it anyways to prevent others from being abused by one of their employees. I am strong and I can take it, but others may not be so strong and blessed with the knowledge that Brevard County allows this kind of thing on a regular basis, as proven by (a) through (c), above. I also believe that it was inappropriate for Rick to bring up the subject of Ms. McKinney’s web site postings in front of his co-workers. I don't mind him bringing up the website postings, but he didn't have to say I lied about him when the evidence proves THERE WAS NO LIE. He CHOSE to take offense at my Conservatism and my ideals. That's what he attacked. He attacked the fact that his name was even associated with such a site. Given the above, I do not believe the major offense of disrespecting a citizen was committed in this situation How convenient and of course you don't., and would strongly recommend against disciplinary action. Shock. Suprise. I'm fainting in astonishment. I will personally review the appropriateness of each of Rick’s actions in this situation with him and anticipate better outcomes in the future. Don't hold your breath. When it's condoned like this, it procreates and multiplies like rabbits. Brevard County has a horrible reputation and it brought the reputation upon itself via actions such as this. NOTE: I notice that neither Mr. Rick Meshberger nor Mr. Sellers denied the fact that a search engine was used and made the effort to find my e-mail a five minute effort on Glenda's part. Now, why was the first estimate so much larger than five minutes and why was the second estimate -- after I had narrowed the search parameters -- so much larger than five minutes and why was the third estimate still an additional twenty-five minutes? Are we being milked for money via "extensive use" of personnel and equipment laws? That search engine Glenda used made finding my request very fast. Why was my e-mail not delivered sooner considering the availability of that search engine? If I'm lying about how things happened at the department, I suppose I'm lying about the search engine and how quickly it found the requested e-mail as well?